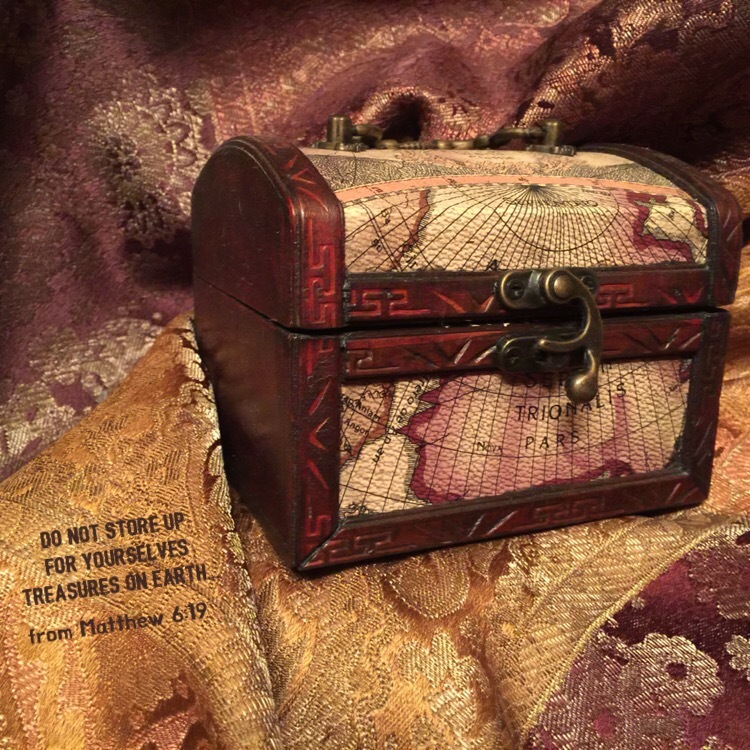 A good friend bought a small treasure chest for me as a gift. She intended for me to use it as a container to place written prayers in. 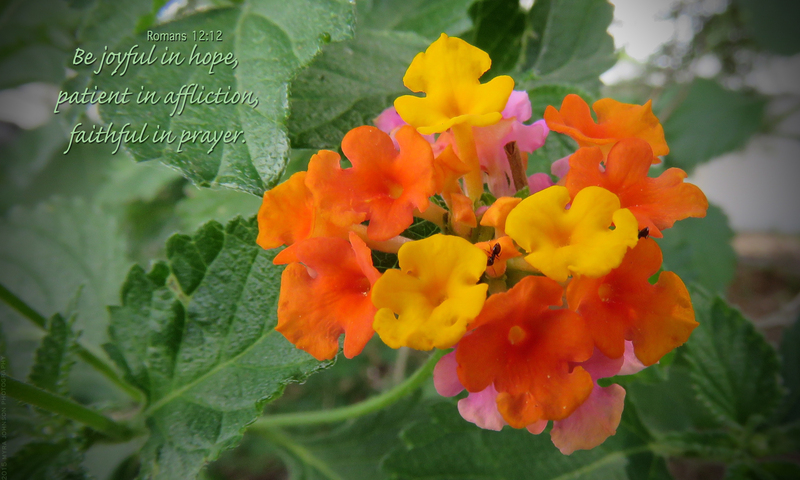 Prayer is something that has eternal significance. Talking with God is the most important communication we have. It is a privilege and a treasure. There are many treasures we could acquire during our time on earth. The most important treasure, however, is our relationship with God. In the Old Testament, we find the account of Daniel, a servant of God, and a plot of evil against him from jealous men. Since Daniel was a person of such integrity, the men realized they would never be able to accuse him of wrongdoing unless it had something to do with his devotion to God. So these administrators and satraps went as a group to the king and said: “May King Darius live forever! The royal administrators, prefects, satraps, advisers and governors have all agreed that the king should issue an edict and enforce the decree that anyone who prays to any god or human being during the next thirty days, except to you, Your Majesty, shall be thrown into the lions’ den. Now, Your Majesty, issue the decree and put it in writing so that it cannot be altered—in accordance with the law of the Medes and Persians, which cannot be repealed.” So King Darius put the decree in writing. The king was then told that Daniel was still praying to his God. Although Darius did not want to, he was forced to give the order to have Daniel placed in the lions’ den. King Darius was troubled all night. The next morning, he went to the lions’s den and found that Daniel was alive! Daniel testified that it was God who had kept him safe. The king had the evil men, their wives and their children thrown into the den where the lions killed them. Then, he issued a decree stating that everyone should fear and have reverence for the God of Daniel. We need God in every area of our lives. He is at work whether we perceive it or not. 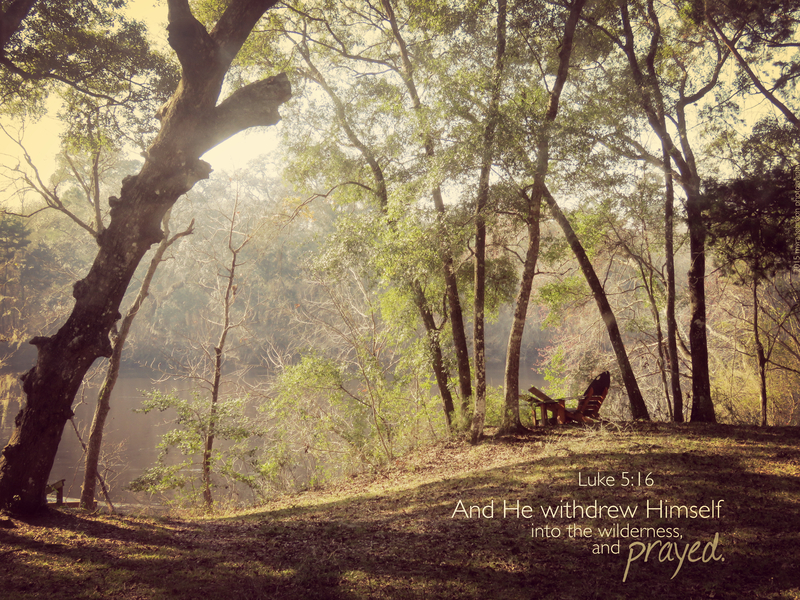 As we come to God in prayer, we remember that He is with us, understanding whatever situation we are experiencing. 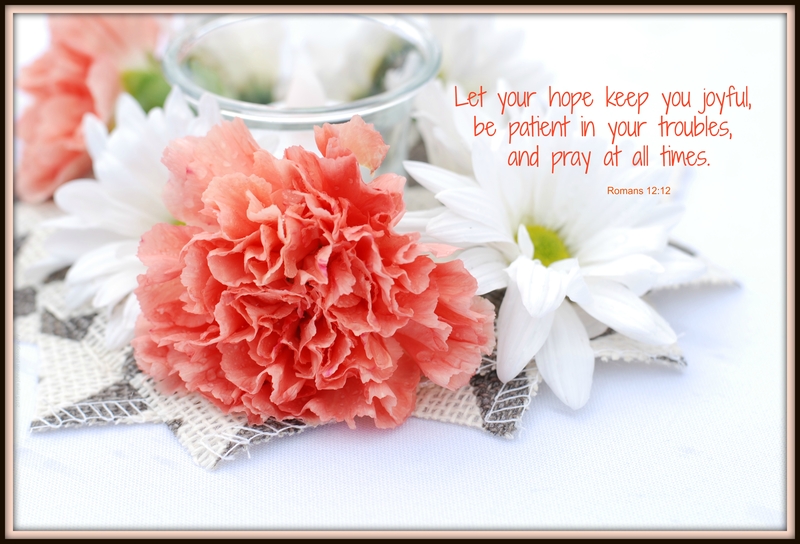 If we are watchful, we will live in expectancy of God. 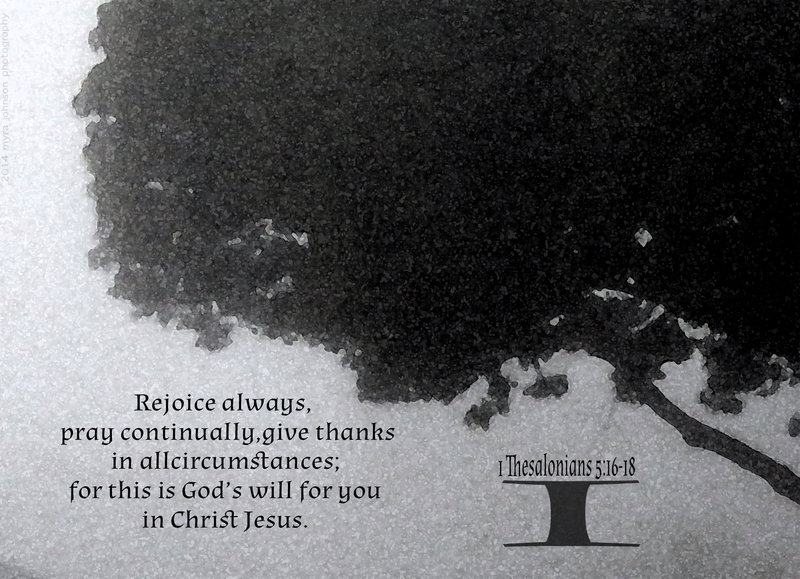 If we are thankful, we will remain in an attitude of appreciation and gratitude for all that He has done. The garden area I saw was lush and inviting, with blooms of many colors. An arch of vines formed a canopy over the brick walkway. The mist was so beautiful, I just had to pull over and photograph it. In my area, fog is most commonly encountered in the early morning, before the warmth of the sun causes it to dissipate. I pray a lot while I am driving my car. It is then that I am usually alone. Morning often finds me commuting to work, praying, and thinking about God and those I love. There is no better way to start the day! and wait for your answer. be made known to God. What should I hold on to? How should I love someone? How should I show respect? 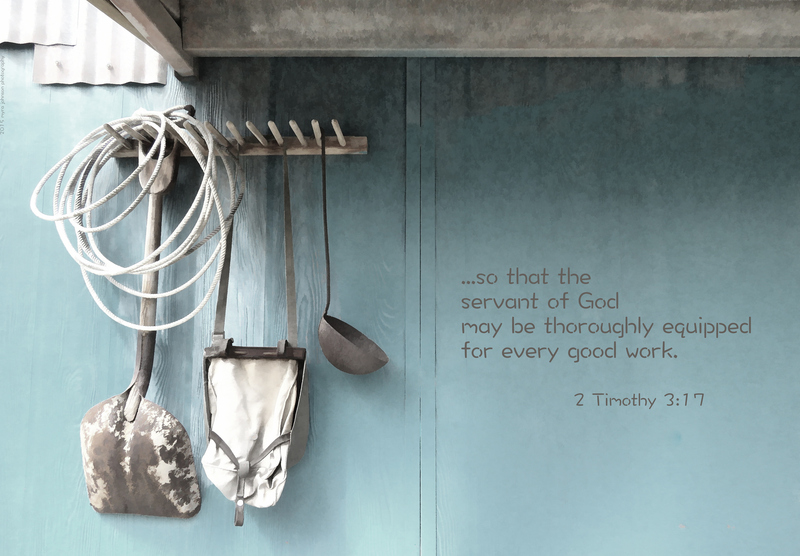 How should I serve the Lord? What can keep me joyful? How should I respond during times of trouble? Should I share my belongings? Should I open my home to people I don’t know? Hate what is evil, hold on to what is good. Work hard and do not be lazy. Serve the Lord with a heart full of devotion. and pray at all times. and open your homes to strangers. God gives a message to the Israelites in the book of Ezekiel in chapter 34. My husband and I went to a nearby city to take care of some details for a family member who has been in the hospital for a few weeks. Arriving at our destination, I got out of my car, even as it was lightly raining, to get a few photographs of a glorious rainbow that had appeared. My husband had gone inside the building. After returning to the car and making a couple of phone calls, we found out that our family member may be well enough to come home in just a couple of days! Showers of water were falling on us in the parking lot. 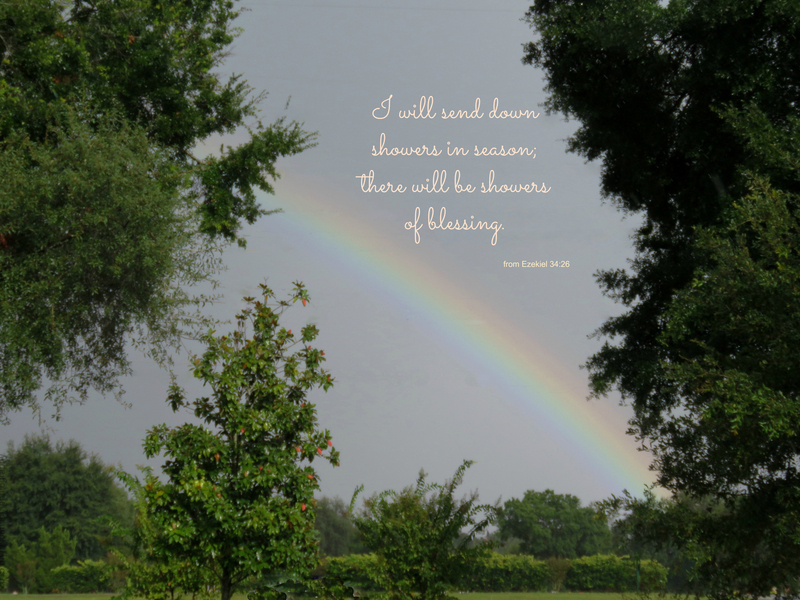 Showers of blessing were falling, too…. 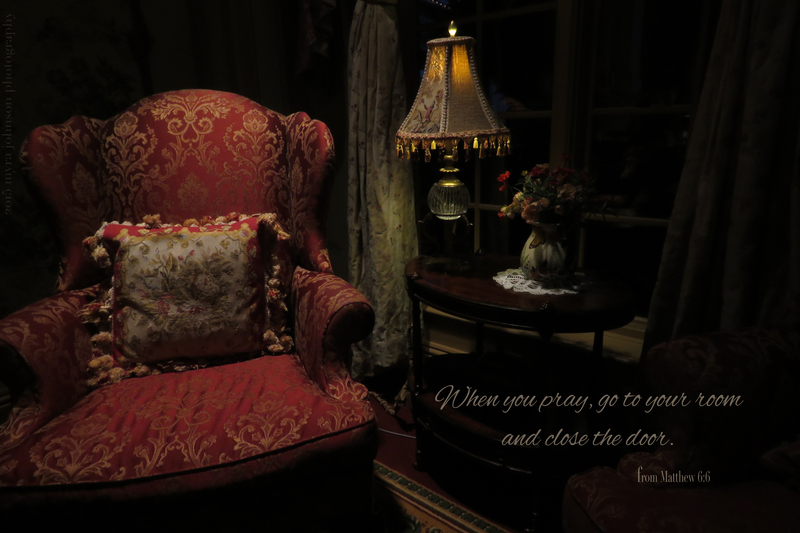 After recently watching a movie that was centered on the power of prayer, I made a decision. In the film, the main character wrote prayers down on paper and attached them to the wall of her closet. It was there that she prayed for many concerns. Considering what the greatest burdens of my heart are, I have begun to write down specific prayers and tape them to a wooden wardrobe in my closet. 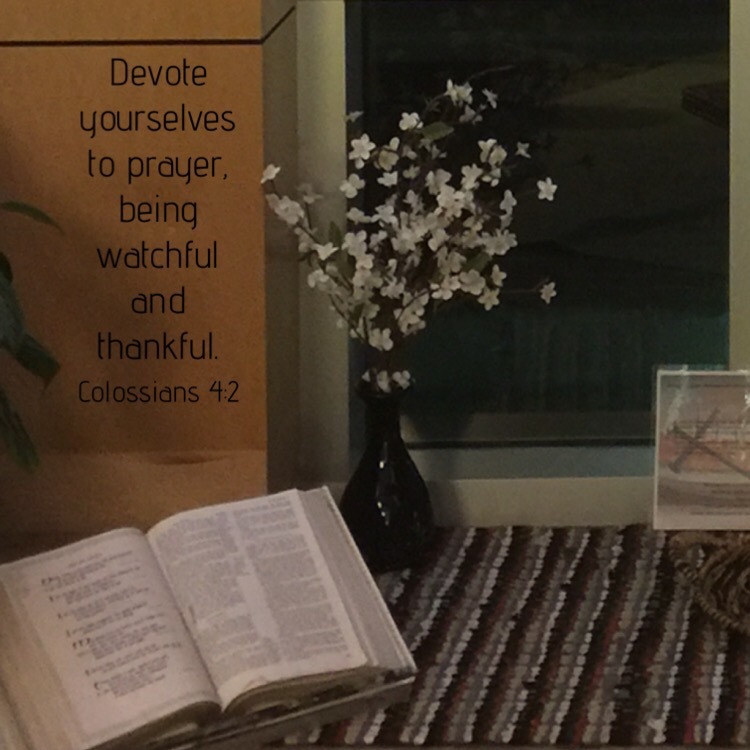 When each prayer has been answered, I will be able to write that answer on the small pieces of paper that are posted there. 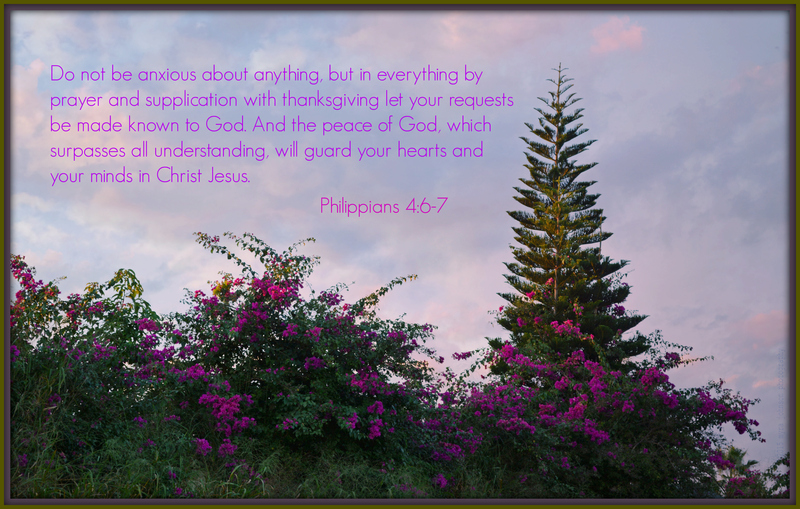 In just writing down my most heartfelt longings, I realize that my intercessory concerns are too big for me to handle. I can’t change someone’s attitude. I can’t give someone else the gift of wisdom. I can’t heal someone from disease. I can’t choose the perfect job for someone else. Coming to Him in prayer about anything and everything, is the best possible action. Father who is with you. what you do in private. Time spent seeking God’s guidance. 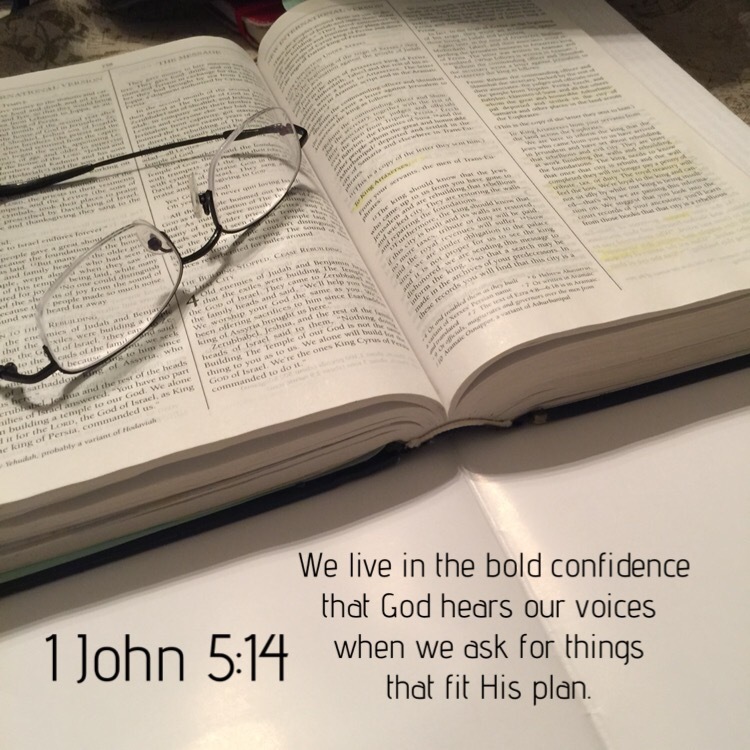 Listening with our hearts for our heavenly Father’s words to gently, yet clearly, speak to us. While visiting my son’s lakeside apartment, I suggested that we take a walk in the park across the street. 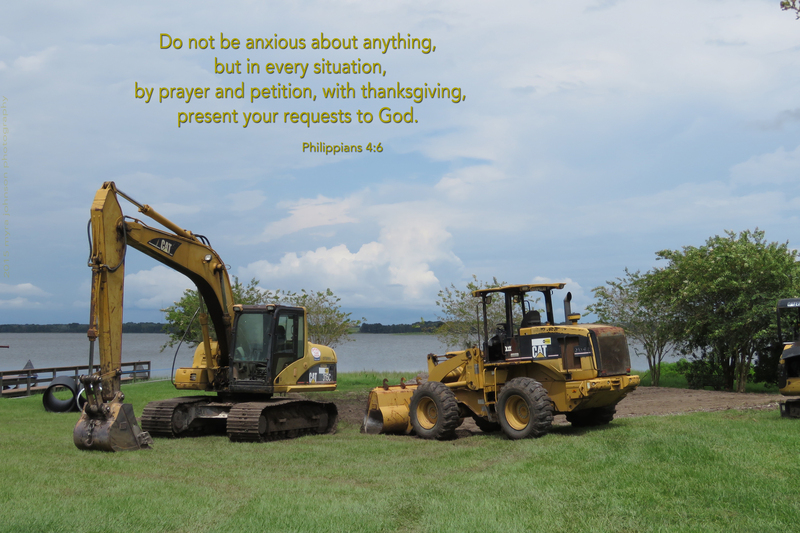 As we began our stroll, we noticed some heavy equipment parked near the fishing dock. Neither of us could tell what work was about to be done, but it obviously looked as though some serious digging was planned. On the way back from our walk, I decided to photograph the machines. Can you imagine what it would be like to have only a spoon with which to dig in order to complete a task like the one probably planned near the dock? Diligent work for weeks and months—perhaps years—might still not be enough to tackle the need. There are many times in our lives when God provides a spoon for us to complete a work because a spoon is all that is needed. At other times, situations loom before us as we feel helpless and defeated with our lack of resources or ability. Sometimes, He is the only One who can take care of a situation. In an instant, He can heal, provide, change, forgive and encourage. Even so, we can forget that He is available to help us. With spoon in hand, we tackle those things never meant to be faced alone. Almost every day at work, I make a list. If I don’t, I risk forgetting something very important. And if I forget something important that I was supposed to do, a lot of my day–or even my week– could go wrong. I have sticky notes on the edge of my computer screen for important dates to remember. Often, I have a paper on my desk, listing my tasks. It is ready for me to add to it at any moment. In the 12th chapter of Romans, there is also a “to do” list. Maybe I should copy this down and place it on my desk at work. If I forget about these things, a lot of my day–and even my week–could go wrong. As I walked by the building, there were pegs on the wall placed in position to hang tools and useful things. To place needed items where they can be easily accessed is always a good idea. I enjoy camping from time to time. Before I go, I make a list of necessary items that I expect to need when I arrive at the site. It is very important to have everything on the list at my disposal. If I don’t have what I need, the trip will not be as successful as I had hoped. What do I need every day in order to be prepared? If I have been consistent in reading the Bible, I will have God’s words stored in my mind. It would be a really good idea to have a Bible placed where I could get to it easily. As I am starting my day, prayer will allow me time to communicate with God, receiving guidance for the hours ahead. Throughout the day, these “tools”—God’s word and prayer—-will be what I need. My friend has a lovely house nestled in the trees near a swiftly moving river. Visiting there this weekend, I sat and watched as the water moved past, never stopping, always traveling. The back yard has branches that canopy over the ground, filtering the setting sun with a warm glow that travels through windows onto the walls within her home. A chair sits in the yard, inviting. Solitary places, devoid of the rush-rush, hurry-hurry business of life allow quiet moments that can be filled with prayer. 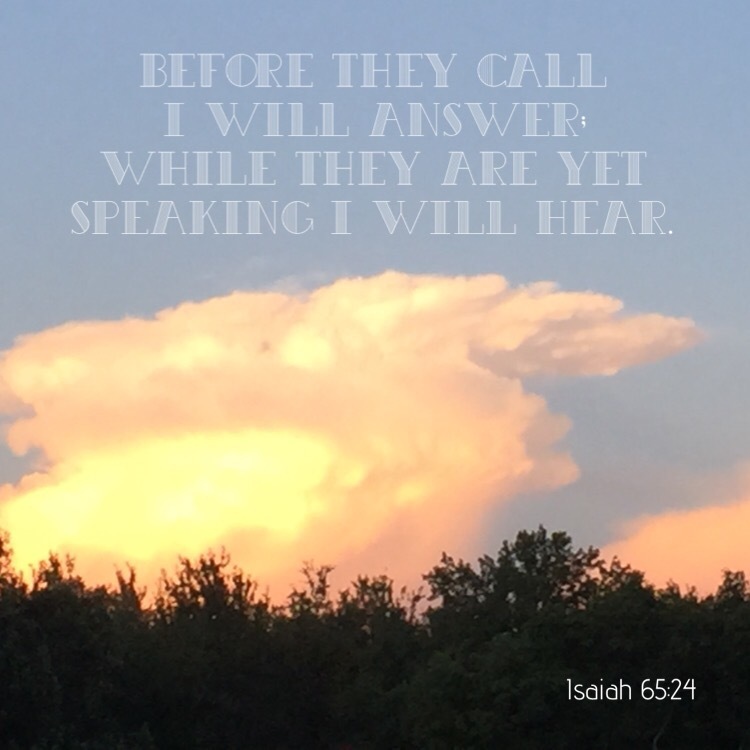 With distractions reduced to the chirping of birds and the occasional scamper of an inquisitive squirrel, listening for God’s voice becomes easier. Whether I am sitting near a river, sitting alone in my car or sitting alone in my home, I can pray. I can talk to God. I can also listen for what He has to say to me. It’s raining now, and I am quietly sleepy. A few days ago, I started getting sick. The sinus kind of sick with watery eyes and sneezing. The kind of sick that keeps you at home, away from people. My husband left for church this morning, leaving me with our tuxedo cat and basset hound. Reflective, I considered my life and the lives of those that I love. The Christmas tree in the room stood tall with decorations interspersed between its branches. I didn’t want to be sick, but since I was, I found comfort in spending time alone, thinking, remembering and sometimes, in prayer. I had recently received a package at work with an order I had sent out some time before. There were several items in the package that were quite important. Last week, I was working at a different location and I had taken the box and its contents with me. Today, I was once again going to work at a different location. I needed two of the items in the box. I looked all over my area, to no avail. I considered that I might have left the box in my car from last week. Checking there, still I could not find it. Walking alone into the area nearest my office, I prayed. Almost immediately, in perhaps only a second or two, my eyes fell on the box. It had been placed in a tall chair and I just had not seen it before. A reminder that God is with me through every moment of the day. He is ready to help me, even if it is only to find a box. In the Old Testament book of Isaiah, God is describing what things will be like when there is a new heaven and a new earth. I feel that I experienced this today. 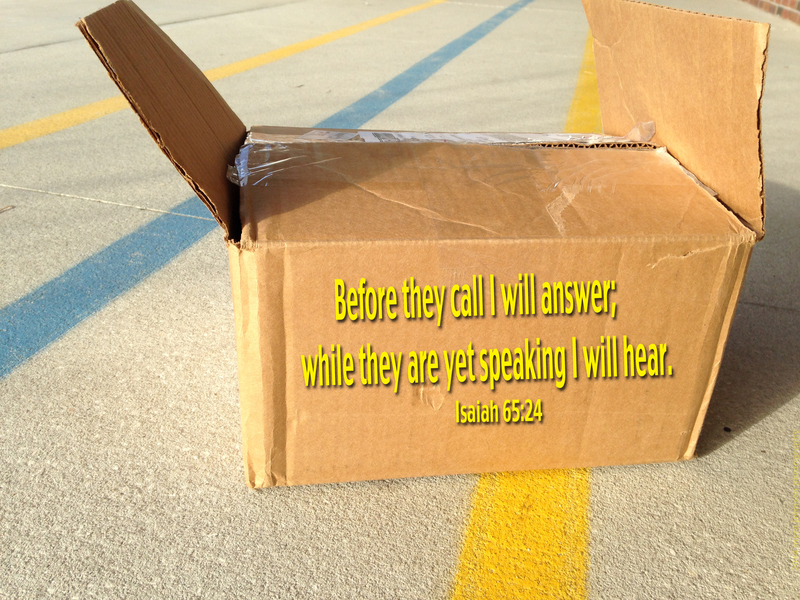 How blessed we are to have a heavenly Father who cares about us and hears us when we call.